We're bringing a pause to our live coverage of the aftermath of Hurricane Harvey. You can read our latest update here, and you can follow the BBC's James Cook in Texas for all the latest updates. Thank you for joining us. One of the buildings that suffered the most damage in Rockport appears to be the Fairfield Suites hotel, where some stormchasers and media had been staying. 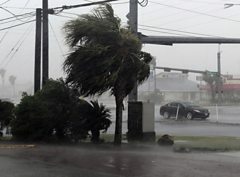 Texas Governor Greg Abbott says that emergency services are focusing on search and rescue operations as the storm threatens to deliver up to 3ft (0.9m) of rainfall. Mr Abbott said that several searches had taken place on Saturday and would continue in the coming days despite sustained winds and torrential rain. Rescue efforts are currently focused on supporting evacuees from the Corpus Christi area, Mr Abbott said, although this area is likely to expand. About 1,000 rescuers have so far been assigned to operations. The commander of the coastguard in southeast Texas, Tony Hahn, has warned that his teams will be watching for potential chemical and crude oil spills in the area in the coming days. He said that Corpus Christi is the third largest petrochemical port in the US and that there was a risk that spills could occur as a result of possible flooding, AP news agency reports. It's calmed down a fair bit compared with a few hours ago, but it's still pretty unpleasant out at sea near Galveston, as this live feed shows. We mentioned earlier that tornadoes have posed a big problem to Texans over the past day - well this shows just how much of a problem. Houston is expected to receive up to 3ft (0.9m) of rain in the coming days, Mayor Sylvester Turner said on Saturday. "This is serious," Mr Turner said in a televised interview, adding: "It is important that people stay off the roads." Mr Turner said that the city was preparing for what he described as a "major water event." 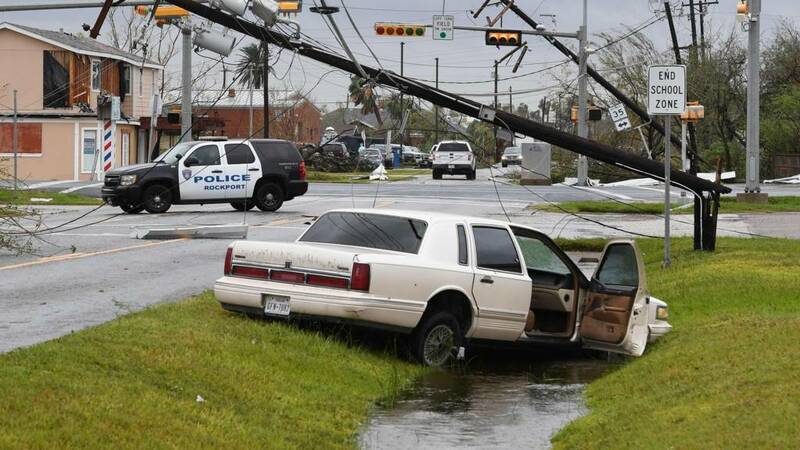 Earlier, the National Weather Service (NWS) reported rainfall of over nine inches in some areas of Houston within 24 hours. We reported earlier that three tugboats had issued mayday alerts. The US Coast Guard has just confirmed that it has rescued 15 people who were in distress near Port Aransas. A public health emergency has been declared in Texas in response to Hurricane Harvey. US Health and Human Services Secretary Tom Price said that "necessary measures" were being taken to "provide immediate assistance" to those affected by the storm. In a statement released on Saturday, Mr Price said that his office recognised the "gravity of the situation" and measures were being put in place that would allow "flexibility" to health service providers caring for those in need of medical attention. He said that some Medicare beneficiaries were likely to have been evacuated to neighbouring communities where hospitals were without records or personal information. Mr Price added that hospitals would be able to "waive certain documentation requirements" in order to provide care where needed. Harvey, that made landfall as a category four hurricane but is now a tropical storm, was the most powerful hurricane to make landfall in the US for 13 years, since Charley hit Florida in August 2004. Across the Atlantic, Charley killed 15 people and destroyed more than $16bn of property (in 2004 currency). Harvey is only the fourth hurricane in 48 years that has been category four or higher on reaching land. But it is not yet clear whether the damage will be on the scale of category five Andrew, that struck Florida 25 years ago this week, or of Katrina (which was a category three when it devastated New Orleans). So where will the storm head next? This map shows the latest projections for its route through southern Texas over the next few days. An unknown man in a suit has been caught on film, apparently trying to surf on a Texan beach in the middle of the bad weather. After a lifeguard stepped in to stop him, he did not look happy and stormed off down the sand. The BBC's James Cook in Rockport says many people could not afford to leave their homes. The city bore the brunt of Hurricane Harvey, but many now face not being able to afford to rebuild their homes. Video caption: Hurricane Harvey: "People couldn't afford to leave"Hurricane Harvey: "People couldn't afford to leave"
You can follow James on Twitter. Rockport's mayor Charles J Wax says one person is known to have died in a house fire that started as Hurricane Harvey passed over the city. It is the first confirmed fatality in the storm. Some of the damage caused to towns in Texas in the past day has been because of associated tornadoes, not just the hurricane winds. One man told CBS News what happened when one struck his home in Sienna Plantation. Video caption: Hurricane Harvey: "The air just sucked out"Hurricane Harvey: "The air just sucked out"
Lots of animals have reportedly been separated from their owners during the chaos. A shelter in Corpus Christi has said it will temporarily take in any it finds, until they can be reunited with their owners. The local police shared the details on Twitter. Meanwhile, another Twitter user, @AaronJayJack, has appealed for help to find the owner of a dog, which, he says, leapt into his car when he stopped for petrol near Runge. He's calling the dog Harvey, and he is currently en route from Victoria to Austin, hoping someone gets in touch. President Trump has held a teleconference with cabinet members to discuss the response to the storm. According to a White House statement, "President Trump emphasized his expectations that all departments and agencies stay fully engaged and positioned to support his number one priority of saving lives." He issued thanks to the "many volunteer and faith-based organizations that are dedicating their time and effort to helping their fellow Americans". The statement ended by saying the president, and Vice President Mike Pence, "extend their thoughts and prayers to those affected".